A few days ago we had the opportunity to go to one of the concerts of the year. 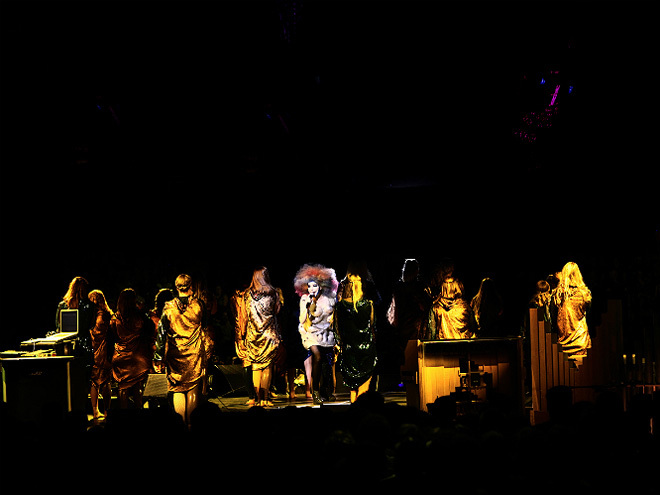 The Icelandic icon Björk put on a spectacular show at London’s Alexandra Palace. The venue has a bit of a reputation for bad sound quality but we didn’t need to worry as Björk evidently has a rather high quality control. No photography or filming was allowed but people didn’t seem to care much. We would never disobey Björk though so we didn’t take more than one photo before it started but we can tell you that it sounded and looked great. The stage was placed in the middle of the hall and had lots of massive wooden machine like things that sometimes started moving when the music went particularly industrial. And it often did, extremely heavy stuff that blew you away. In contrast to this she had the Icelandic women’s choir ‘Graduale Nobili‘ that juxtaposed the bassy beats brilliantly. The favourite was ‘Isobel‘ where the choir mimicked the intricate string section, originally arranged by Brazilian composer Eumir Deodato. They also filmed the whole show for a dvd release (or maybe TV, we don’t know) so after some of the songs, Björk kindly asked if they could do a repeat, and no one complained of course. At the end of it she said: ‘God, I’ve never chatted this much at a show’ which makes us wonder how quiet she would be if the filming wouldn’t have been going on. We guess she’s all about performing and not entertaining. And that she does brilliantly.